The vast majority of U.S. patients are open to using telehealth solutions, but only a fraction have received care virtually, according to a new survey. The Advisory Board Co.'s Virtual Visits Consumer Choice Survey reported more than three-quarters of nearly 5,000 respondents would see a doctor virtually, while less than 20% already have used telehealth solutions. The results suggest that the healthcare industry has yet to meet consumer interest in virtual care, researchers said. "Direct-to-consumer virtual specialty and chronic care are largely untapped frontiers," Emily Zuehlke, a consultant for the Advisory Board's Market Innovation Center, said in a statement. "As consumers increasingly shop for convenient, affordable healthcare—and as payers' interest in low-cost access continues to grow—this survey suggests that consumers are likely to reward those who offer virtual visits for specialty and chronic care." Many providers are investing in a big way in telehealth, which was valued as a $18.2 billion global market in 2016 and is estimated to reach $38 billion by 2022, according to a Zion Market Research study. Patients can download apps that will immediately connect them with a physician and have a prescription routed to the pharmacy in minutes, which can be ideal for minor issues such as rashes or colds and chronic matters that require frequent checkups. Virtual direct-to-consumer healthcare delivery has been touted as a means to increase access, improve outcomes and lower costs, which satisfies value-based payment reforms. Yet, whether there are actual cost savings has been debated. While telehealth is cheaper than traditional doctor or hospital visits, more people may seek care because it is easier to use, driving up healthcare costs, according to a recent study from the RAND Corp. Integrating these tools can also be costly. "While these survey results should be a wake-up call to healthcare providers, they must realize that virtual visits are not appropriate for all providers or appealing to all patients," the Advisory Board said in a news release. Care quality was cited by 21% of respondents as the top concern with a virtual visit, the Advisory Board noted. Nearly 20% said they were worried that the provider would not be able to diagnose or treat them virtually and that they would have to go to a clinic anyway. Of the 77% of respondents who said they'd be willing to try virtual care delivery, the best uses they cited for telehealth include asking a prescription question or getting a refill; seeing a provider for pre-surgery and certain post-operation appointments; receiving ongoing results from an oncologist; and receiving ongoing care for chronic condition management. Select pregnancy checkups, weight loss, coaching to quit smoking, dermatology consults and psychologist consults also ranked among top offerings. Nearly 40% of the parents surveyed said they had used virtual checkups for their children. Nearly all of the patients who said they had used telehealth were 49 years old or younger, while privately insured, higher-income patients were far more likely to use virtual visits than Medicaid or Medicare patients in lower-income brackets. 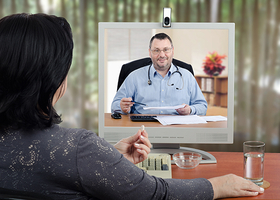 Oakland, Calif.-based Kaiser Permanente conducted more than half of its 2016 patient encounters virtually, 90% of large employers plan to offer telehealth services in 2017 and 63% of healthcare providers use a form of telehealth, according to the Advisory Board survey. The telehealth market is poised to grow as patients are more willing to pay to receive care at their own convenience, said Tom Cassels, national strategy partner at the Advisory Board. "Healthcare providers can no longer wait to catch up," he said.